Please help honor Ryan's memory and battle with bipolar disorder by donating to advance research benefiting loved ones suffering from bipolar. Ryan Patrick Johnson of Robbinsdale, Minnesota chose to end his struggle with bipolar disorder on June 28, 2016. His beautiful spirit and loving nature touched so many people in his 25 years of life. We will miss his brilliant smile, charming nature, and infectious sense of humor. His smile brought sunshine into our days and joy to everyone he met. 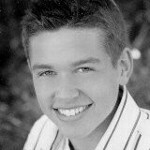 Ryan was born on May 8, 1991 in St. Louis Park, Minnesota. He is survived by his adoring parents, Mary Jo and Patrick Johnson; his brother, Nathaniel Johnson; Nathaniel’s partner, Kristen Kloubec; grandparents, Joan Butler, Terry Butler, and Ronald and Patty Johnson; and numerous aunts, uncles, cousins, and friends. Ryan attended Cross of Glory Preschool in Brooklyn Center, Lakeview Elementary in Robbinsdale, Sandburg Middle School in Golden Valley, Cooper High School in New Hope, the University of Minnesota in Minneapolis, and the University of Iowa in Iowa City. Ryan lived like every day was his last and never wanted to waste a minute. He played piano, percussion, and guitar. He participated in baseball, football, cross-country running, and wrestling, and continued to work out even during his most difficult days. Ryan had a heart for God and working with others. In elementary school, he was chosen to accompany “special needs” children to Como Park Zoo. In high school he worked as a youth counselor at a Christian boy’s camp and was selected to be a personal attendant to a young man with Down syndrome. In college he worked in a group home for young men with social and behavioral challenges and volunteered at a summer camp for boys with muscular dystrophy. Most recently, Ryan worked with Special Olympics during graduate school. Although we will miss him every day, especially his warm smile, he will forever remain in our hearts. Please help us keep Ryan’s legacy alive by doing one selfless act of kindness in his honor each year on May 8th. It will mean the world to Ryan and those who love him!